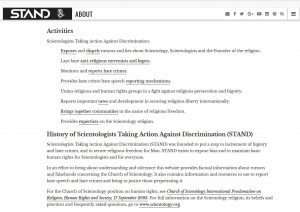 Scientologen ergreifen Maßnahmen gegen Diskriminierung und schufen ihre Internet-Plattform STAND – „Scientology Taking Action Against Discrimination“. | Willkommen auf den Seiten des "Krokodil"
← 2018 Neues von der „Nigeria-Connection“- Betrüger mit neuer Story im alten Gewand. Verhaftungserfolg ! 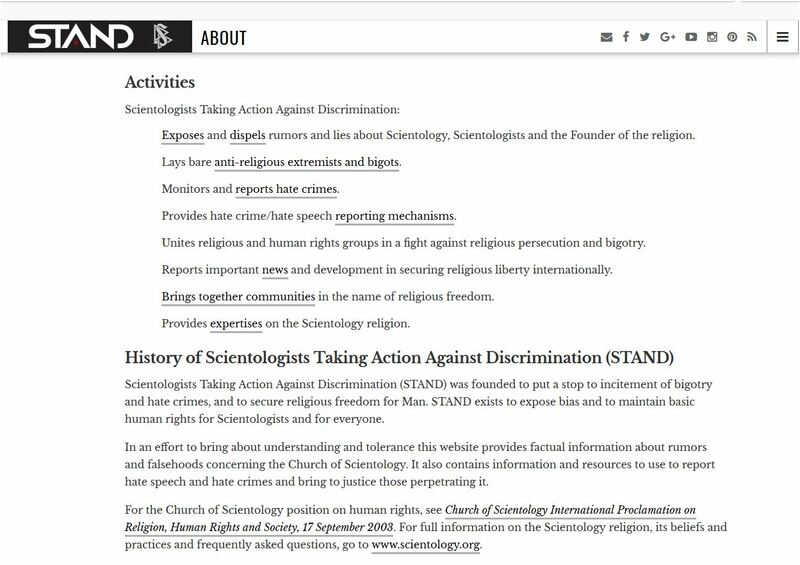 Der Zweck von „Scientologists Taking Action Against Discrimination (STAND)“ ist es, die Diffamierung und den Fanatismus gegenüber Scientologen und der Scientology Religion für immer zu beenden und das grundlegende unveräußerliche Recht aller zu schützen, ihren gewählten Glauben zu praktizieren. Scientologen, die gegen Diskriminierung vorgehen wird empfohlen, antireligiöse Extremisten und Fanatiker bloß zu legen und „Hassverbrechen“ zu überwachen und zu melden, Gutachten zur Scientology-Religion zur Verfügung zu stellen und über wichtige Neuigkeiten und Entwicklungen bei der internationalen Sicherung der Religionsfreiheit zu berichten. Die Webseite entstand im Jahre 2013. Exposes and dispels rumors and lies about Scientology, Scientologists and the Founder of the religion. Lays bare anti-religious extremists and bigots. Monitors and reports hate crimes. Provides hate crime/hate speech reporting mechanisms. Unites religious and human rights groups in a fight against religious persecution and bigotry. Reports important news and development in securing religious liberty internationally. Brings together communities in the name of religious freedom. 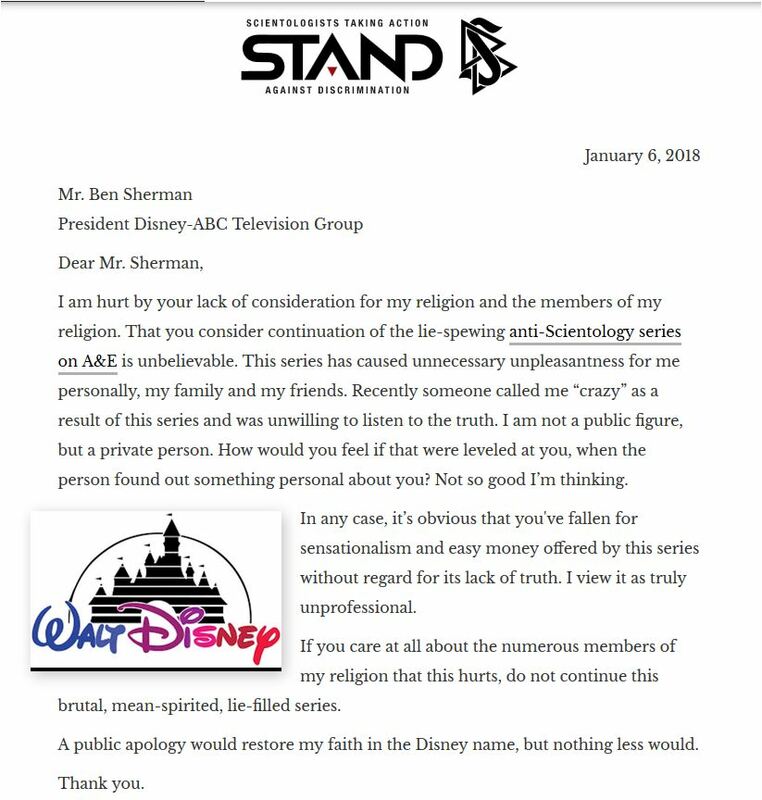 Im Internet ist nun auch aktuell im Januar 2018 eine STAND-Scientology-Kampagne gegen den Präsident der Disney-ABC TV Group ersichtlich. 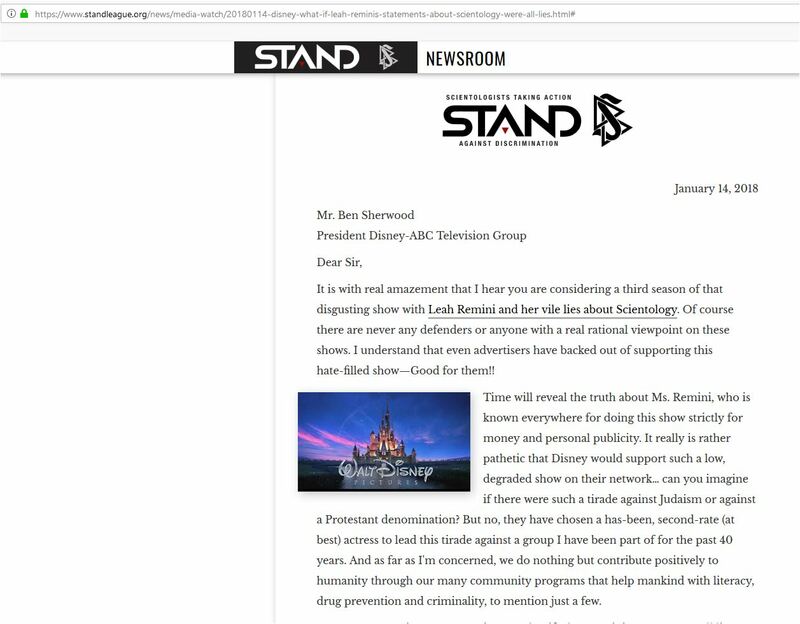 Gleich mehrere Schreiben von Scientologen an die weltbekannte Firma Walt-Disney sind bei STAND veröffentlicht und haben zum Ziel, die Disney-ABC-TV-Group zum Absetzen der Leah Rimini-Dokumentation über Scientology zu bewegen bzw. deren Ausstrahlung zu verhindern, denn diese befasst sich kritisch mit der Scientology-Bewegung. 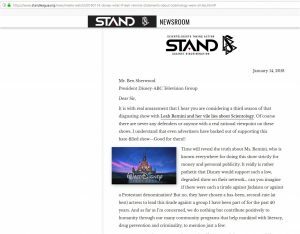 Angriffsziel der scientologischen STAND-Kampagne ist Ben Sherwood, Co-Chairman und Disney Media Networks President der Disney|ABC Television Group. Am 06. 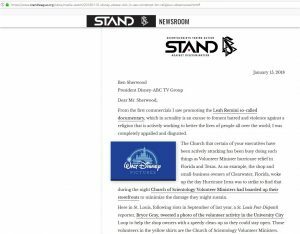 Januar 2018 schrieb die Scientologin Nancy Miller folgenden Brief an die Firma Disney, in dem sie sich über die mangelnde Rücksichtnahme auf ihre „Religion“ und die ihrer „Mitglieder ihrer Religion“ beschwert. Sie fühlt sich verletzt und findet es unglaublich, dass die lügensprechende Anti-Scientology-Reihe auf dem Sender A&E fortgesetzt wird. I am hurt by your lack of consideration for my religion and the members of my religion. 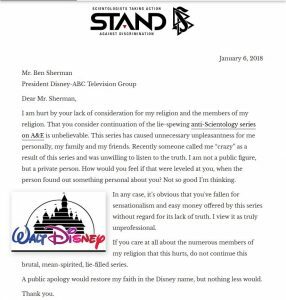 That you consider continuation of the lie-spewing anti-Scientology series on A&E is unbelievable. This series has caused unnecessary unpleasantness for me personally, my family and my friends. Recently someone called me “crazy” as a result of this series and was unwilling to listen to the truth. I am not a public figure, but a private person. How would you feel if that were leveled at you, when the person found out something personal about you? Not so good I’m thinking. In any case, it’s obvious that you’ve fallen for sensationalism and easy money offered by this series without regard for its lack of truth. I view it as truly unprofessional. If you care at all about the numerous members of my religion that this hurts, do not continue this brutal, mean-spirited, lie-filled series. A public apology would restore my faith in the Disney name, but nothing less would. Am 14. Januar 2018 wird ein zweiter offener Brief eingestellt und die Aktion fortgesetzt. Auch dieser ist an den Präsidenten der Disney-ABC Television Group gerichtet. It is with real amazement that I hear you are considering a third season of that disgusting show with Leah Remini and her vile lies about Scientology. Of course there are never any defenders or anyone with a real rational viewpoint on these shows. I understand that even advertisers have backed out of supporting this hate-filled show—Good for them!! Time will reveal the truth about Ms. Remini, who is known everywhere for doing this show strictly for money and personal publicity. 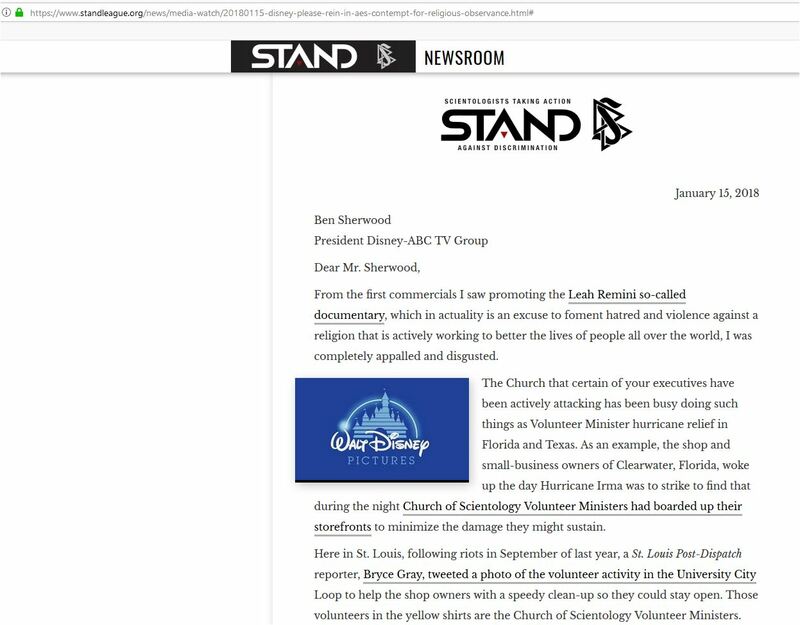 It really is rather pathetic that Disney would support such a low, degraded show on their network… can you imagine if there were such a tirade against Judaism or against a Protestant denomination? But no, they have chosen a has-been, second-rate (at best) actress to lead this tirade against a group I have been part of for the past 40 years. And as far as I’m concerned, we do nothing but contribute positively to humanity through our many community programs that help mankind with literacy, drug prevention and criminality, to mention just a few. I entreat you to view your conscience. What if what Remini promotes are all lies? Am 15. Januar 2018 schreibt ein weiterer Scientologe an die Firma Walt Disney und unterstellt dem Dokumentarfilm von Leah Rimini den Vorwand um Hass und Gewalt gegen eine „Religion“ zu schüren, die aktiv daran arbeitet, das Leben von Menschen auf der ganzen Welt zu verbessern. Er gibt sich „völlig entsetzt und angewiedert“. From the first commercials I saw promoting the Leah Remini so-called documentary, which in actuality is an excuse to foment hatred and violence against a religion that is actively working to better the lives of people all over the world, I was completely appalled and disgusted. The Church that certain of your executives have been actively attacking has been busy doing such things as Volunteer Minister hurricane relief in Florida and Texas. As an example, the shop and small-business owners of Clearwater, Florida, woke up the day Hurricane Irma was to strike to find that during the night Church of Scientology Volunteer Ministers had boarded up their storefronts to minimize the damage they might sustain. Here in St. Louis, following riots in September of last year, a St. Louis Post-Dispatch reporter, Bryce Gray, tweeted a photo of the volunteer activity in the University City Loop to help the shop owners with a speedy clean-up so they could stay open. Those volunteers in the yellow shirts are the Church of Scientology Volunteer Ministers. This is just one of five of the Church’s international community outreach programs. The focus of the others is (1) to help children learn of the dangers of drugs (as other news outlets have recognized that opioid use and deaths have reached epidemic proportions, this is essential), (2) educate people on the Universal Declaration of Human Rights, (3) as the only watchdog over the mental health industry, investigate and expose the human rights abuses that are occurring in that industry, and (4) give children a moral compass in the form of a common-sense moral code. It is completely despicable that you would continue to allow such a show, based on lies, to be aired—especially when the target of their vitriol is trying to improve conditions in a troubled world. This hate-filled, incendiary spectacle has resulted in some 500 documented threats of violence or death, acts of vandalism and hate targeting the Church, its parishioners and its leaders. Under these circumstances (not to mention the Universal Declaration of Human Rights and the U.S. Constitution Bill of Rights, both of which espouse freedom of religion) the employment of Paul Buccieri, Nancy Dubuc and Rob Sharenow should be terminated, and the remaining executives at A&E should publicly apologize for this atrocious series. 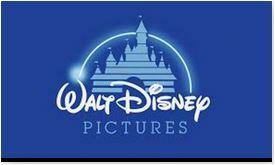 Wir hoffen, dass die Meinungsfreiheit auch für die Dokumentation der Leah Rimini gilt und es nicht gelingt, die weltweite Walt-Disney-Produktion in die Knie zu zwingen. 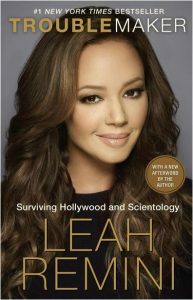 Leah Rimini ist eine der prominenten Schauspielerin und Scientology-Aussteigerin. „Troublemaker -Surviving Hollywood and Scientology“. Dieser Beitrag wurde unter Allgemein, Prominente Scientologen, Scientology, Scientology - Diverses abgelegt und mit Aufklärungsggruppe Krokodil, Ein Bericht von Jörg Stolzenberger, Leah Rimini "Troublemaker", scientologische "STAND"-Kampagne gegen Walt Disney, „Scientologists Taking Action Against Discrimination (STAND)“ verschlagwortet. Setze ein Lesezeichen auf den Permalink.